This is the story behind my Guinness World Record™ for the Most chopsticks snapped in a minute. It was almost time to go snapping. But I couldn't think that far ahead just yet. First, I needed to plan a multitude of things to enable me to attempt this world record. I'd been dreaming of making this attempt for several months and now I had the chance to do just that. How exciting. Even the thought of arranging witnesses, a venue, the chopsticks and all the evidence had me hyperactive with delight. Week after week went by. During this time, I scoured shops in the city for chopsticks. But not just any new ones – no, I was determined to source used ones! Yes, that is strange, and the idea even seemed strange to me at first. That was until I learned how the forests of the Amazon Basin are being cleared for things as simplistic as, well, chopsticks. I couldn't contribute to that by snapping dozens. So, to minimise my impact, I picked saliva-speckled pairs of freshly used chopsticks out of sushi bar rubbish bins, and got staff collecting more for me. Some of the looks I got were bizarre, but when I explained the world record aspect, I generally received a warm smile. And that was all I wanted: help to collect the items I needed. I stored the chopsticks outside my house because I didn't fancy tens of strangers' drying saliva lying around my lounge. Almost a month passed as I collected and counted chopsticks with tiny coloured bits of chewed food stuck to them, and stuck together by the glue created from food sludge mixed with saliva smears. What a pleasure it was to look at all this, especially when I was hungry – which is often. But I needed to keep that world record goal in mind, so I controlled myself when working with the sickening mess lightly coating the thin end of each chopstick I handled. 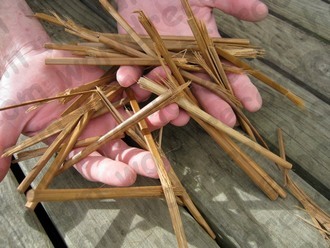 Then, much to my relief, I saw I had enough chopsticks to attempt the world record. The only repulsive part about that was I'd be gripping the chopsticks in my bare hands. Oh no! But I had to do it, because nothing will get in the way of my passion for world records. I called up a charismatic personality I know not far from me and asked if his family would like to see a few world record attempts in their front garden. “Hold on – I'll ask!” was the excited reply. And sure enough, daughter, wife and a friend all agreed this could be interesting. I was booked. And I was hooked, it seemed. Because I kept wanting to snap a chopstick or two in preparation each time I passed the stored bag. But somehow, I managed to control myself and left them all alone – apart from regular practising - until the big day arrived. My assistants and I were greeted by a roomful of ladies, all keen to see this action they'd been told about. I grunted and smiled bashfully, thinking it was more like high-energy work for me and convenient entertainment for them. I was escorted out to the back of the house where I practised one last time; I'd been snapping chopsticks on a regular basis by then, so I was confident in my abilities anyway. I nodded to the very active home owner and he helped move a table to just inside the property's front gate. We left this open so anyone could wander off the street and prove to us just how inquisitive humans can be. I laid out the chopsticks in neat patterns, taking into consideration how my wrists would need to move repetitively in order to work at speed. Although I thought some chopsticks would stick to the table by the remnants of saliva on them, that didn't happen and I was glad to discover it. Once the required admin had been seen to and the timekeeper had instructed me to begin, it was a fairly straightforward process: snap, advance, snap... Probably the toughest part was making myself continue, even though my wrists and forearms were stinging from the hyperactivity. But it was literally all over in a minute as determined by the trusty stopwatch. I stood back from the hunched stance of an automated speedy snapping machine I had briefly adopted. My hands dangled at my sides, throbbing and tired. I breathed for a moment in silence, gathering my thoughts. I wasn't aware of any passers-by who'd stopped to see this uncharacteristic behaviour taking place, but if any had, I bet they'd have told the next person they came across. I caught myself in thought, knowing it was not time to rest yet. There was a little more admin to do and I needed to capture the essence of the event right then. It only took a few minutes and we were joking among ourselves at what I'd just spent roughly a month working towards. The others couldn't believe what I dedicate my time to! Chopstick halves lay strewn across the table, and around the grass. The odd part-stick even landed as far away as alongside the flower beds. I looked up, having regained my energy and being ready to pick up all the randomly fallen half-chopsticks. It was then that I remembered the ladies hanging out of several bedroom windows, watching my crazy antics with great interest. We exchanged glances and I could see they were definitely amused. More than merely amused, I was now focused on getting this world record attempt's evidence posted to the judges because what I really wanted was another prized certificate. It had been a swift and simple event, but one that I would be immensely pleased to receive the result for: yet one more world record to add to my increasing list. And, I'll let you know, list is getting long. It's so long, in fact, that when I lay all my world record certificates end to end, the line is longer than my house! Fantastic. That's what I live for.